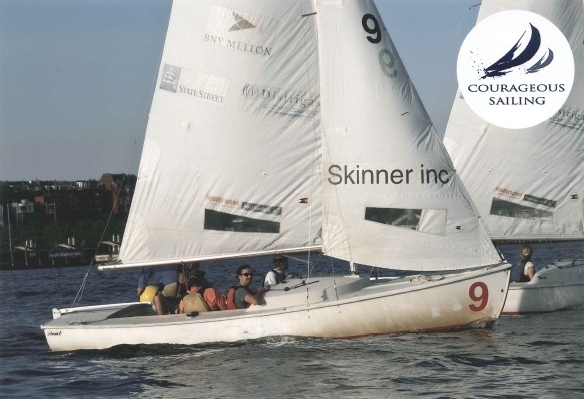 Courageous Sailing | The Corporate Challenge Regatta | Skinner Auctioneers & Appraisers | Skinner Inc.
Courageous Sailing is a non-profit organization that aims to use sailing to build character and camaraderie among Boston children from all economic and ethnic backgrounds. Skinner’s participation in the program helps to raise money for the camps and instructional programs that the group runs. The Corporate Challenge takes place on Pier 4 in Charlestown. There we gather at 6PM each Monday for the “Skipper’s Meeting” where the Courageous staff lays out the expectations for the night. This may include race rules, how many races we’ll have, and what the wind is like. Then we race — against other Boston-area businesses in the shadows of the Boston skyline. Sailing gives us a great chance to get out of the office and work together in teams. Sometimes we even manage (thanks to our esteemed skipper Eric Jones), to place well! Of course, the best time we have at sailing is after the sunset cannon sounds and our regatta organizers call us back to the docks. That’s when they break out the world’s best clam chowder and finger sandwiches, and of course cold, refreshing beer, which we enjoy along with our fellow Corporate Challengers. This entry was posted in Blog and tagged boston, charity, chris barber, Corporate Challenge Regatta, Courageous Sailing, Eric Jones, sailing, skinner by Chris Barber. Bookmark the permalink.